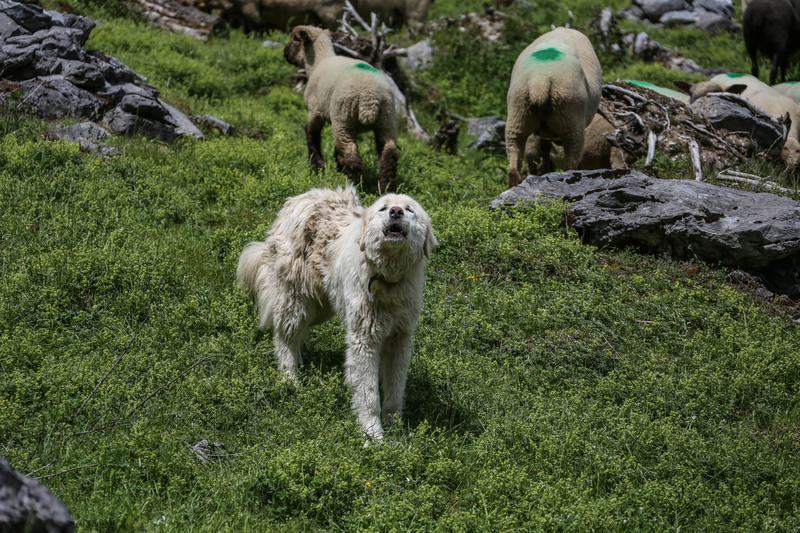 The depredation of livestock by wolves is increasingly becoming an issue, especially to the thousands of small sheep owners in the alpine regions. Many people see the solutions involving electrical fences, livestock guarding dogs and shepherds as too complicated and costly to implement. This is also the main reason why many agricultural representatives are calling for wolf-free zones. There are currently many ideas being tested to use technology to reduce the livestock depredation risk. One of these ideas builds upon the fears wolves develop, when coming in contact with electrical fences. Instead of fencing all sheep, another method involves the so-called shock collar. People used this method to train dogs back in the 1960s. Researchers tested shock collars on wild wolves as a non-lethal method to minimise livestock depredation already 10 years ago in Wisconsin (full study below). The technology used in 2004 was Innotek, the Invisible Fence Technologies. Dog trainers in the 1960s used the shock collar, also known as the e-collar. The electric pulse device in the collar responds to barking and a remote control. The 6 000 Volt electric shock trained the hunting dogs behaviour effectively. However, recently several countries, including England, banned the usage of shock collars for dogs in 2018, after campaigns of animal welfare organisations. The studies from 2004 used GPS based ‘fences’ which triggered electric shocks in case the wolf crossed the line. With new technologies, such as Bluetooth 5.0 and Near Field Communication, other options become available. The potential for using those technologies is high. The Bluetooth 5.0 signal works effectively over a distance of 100 meters. A potential development could be to place an electronic chip in the collar of sheep, which triggers an electronic shock in the wolf collar. The chip triggers the shock at the moment that the wolf approaches a sheep closer than 30 meters, for example. The main shortcoming is the electrical power needed for the Bluetooth technology and the automatic pairing of the collars. The NFC technology, used by modern smartphones, provides an alternative. Unlike Bluetooth, the NFC technology does not require a device for data transfer. NFC automatically connects and transfers data to other NFC devices within a specific range. The current technology restricts the working range still to approximately 10 cm. However, the NFC technology will develop to be effective over a distance of 20 meters and even further in the future. The chip, based on ‘passive tags’ will not require power or a battery. As a result, the collars are effective day in day out. The idea to use chip enabled shock collars as non-lethal methods to scare wolves away from livestock is potentially a big step forward. With the automated triggering, collared sheep and wolves could again be able to roam freely. The use of electric fences and livestock guarding dogs, as well as shepherds, will not be necessary any longer. In fact, this technology also offers the opportunity to apply the chip-triggered shock collars to stray dogs and house dogs. Every year, dogs are responsible for a big portion of depredated livestock as well, besides wolves. In theory, this could work. Practically, there are some big dilemmas. Do we really want to move in the direction that people control everything? Are people going to catch and collar every of the 17 000 wolves, not to mention the 25 million sheep in Europe? Will we interfere with the natural behaviour of wild animals, to save a small percentage of livestock each year? The wolf is back in Luxembourg!